If you’ve had the misfortune of losing all or most of your teeth (a condition called edentulism), you still have effective options for restoring lost form and function to your mouth. There is, of course, the traditional removable denture that’s been the mainstay for edentulism treatment for decades. If you haven’t experienced significant bone loss in the jaw, though, a fixed bridge supported by titanium implants could be a better choice. But what if bone loss has ruled out an implant-supported fixed bridge? There’s still another option besides traditional dentures — a removable “overdenture” that fits “over” smaller diameter implants strategically placed in the jaw to support it. A removable, implant-supported bridge offers a number of advantages for edentulism patients with significant bone loss. Speech Enhancement. Any denture or bridge supported by implants will have a positive impact on speech ability, especially involving the upper jaw. But patients who’ve previously worn removable dentures may not see a dramatic difference but will still be able to benefit from the greater stability of the denture, particularly if the dentures were previously unstable. Hygiene. A removable denture allows better access to implant sites for cleaning. Better hygiene reduces the risk of gum disease and further bone loss. Long-Term Maintenance. Regardless of which type of implant supported restoration is used, it will eventually require some maintenance. 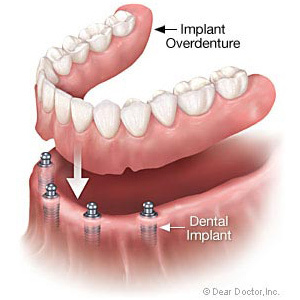 A well-designed removable overdenture can make any future maintenance easier to perform. To find out which restoration option is best for you, you should first undergo a thorough examination to determine the status of your facial and jaw structures, particularly the amount of bone mass still present. Ultimately, though, the decision should be the one that best fits your functional needs, while fulfilling your desires for your future smile.